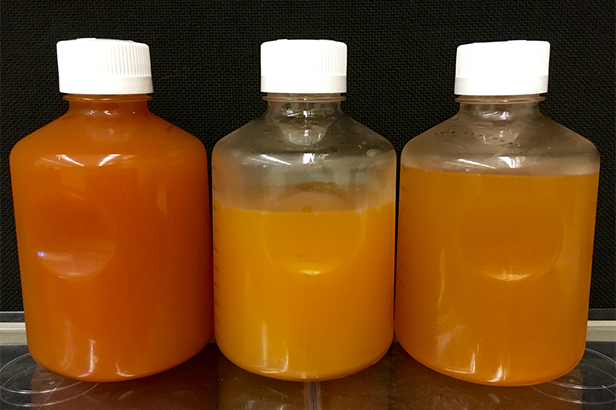 These jars contain samples of “produced water fluids” from wells in Marcellus and Utica shale formations. By analyzing the genomes of microbes in the water, the researchers are piecing together the existence of microbial communities inside the wells. The Ohio State University Department of Microbiology provides an interface between academic molecular biology and real world applications in human health care and environment. The teaching and research interests of microbiology faculty span all aspects of interactions of microorganisms with animals and the environment. The Department of Microbiology has a rich history and long tradition of training world-class scientists. Research projects, financed by federal, state, industrial, and private sources, with more than $5 million in revenue annually, result in more than 50 research articles, reviews and books each year. Matthew Sullivan, professor of microbiology, is the Virus Coordinator for the three-year Tara Oceans research expedition and senior author of a new study that leverages this unique sampling platform to systematically characterize viral communities. Combining electron microscopy and next generation sequencing, Sullivan and colleagues show that the 70-year-old ecological hypothesis that “everything is everywhere and the environment selects” developed for macro-organisms also applies to ocean viruses. This and other work that Sullivan and his lab contributed to describe the diversity, ecological drivers and interactions of viruses, prokaryotic and microbial eukaryotes in the surface waters of the world’s oceans. The department’s PhD program offers an individualized approach to graduate study in one of the nation’s largest teaching and research institutions. Students will actively participate in planning their graduate program while working with colleagues from around the world. In this new era of genomics and molecular life science research students on PhD track are well on our way to training the next generation of researchers. Faculty members in the Department of Microbiology have research interests that cover all aspects of the biology of microorganisms and their interactions with humans, animals, and the environment. Research topics range from the molecular basis of diseases and antibiotic resistance to production of commercial enzymes, from immunobiology and cancer to pollutant biodegradation and environmental remediation, from life at 100°C at the bottom of the ocean to photosynthesis, from basic molecular mechanisms to food protection and bioenergy.